Humanity can no longer afford to sit, watch and blame governments or corporations while our planet is being destroyed. We MUST ALL take EMERGENCY Recovery Actions around the world or loose it all. 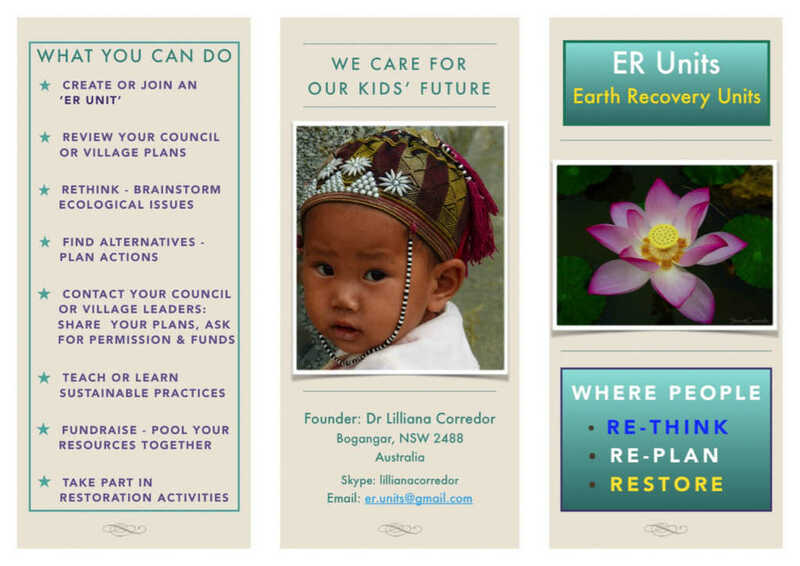 ‘ER Units’ – ‘EARTH RECOVERY Units’ – grow out of the despair and concern of people around the world for a viable planet. 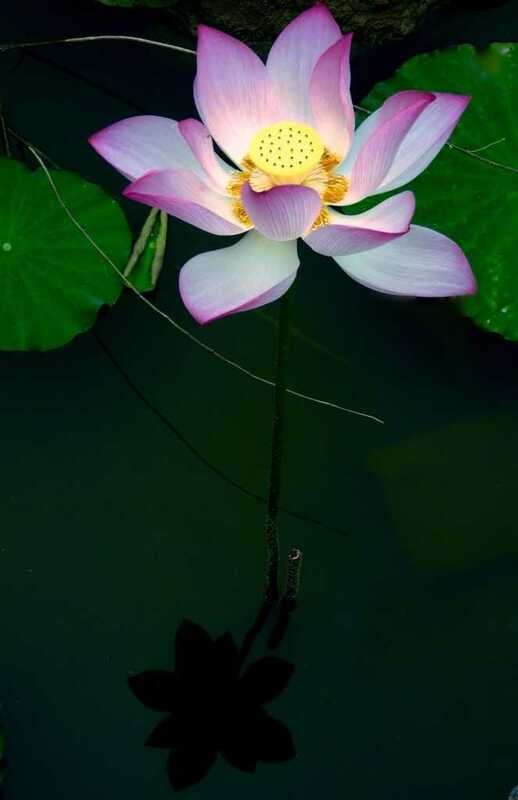 2) RESTORE the Earth in your vicinity. You can do this by implementing the 3 Rs: RETHINK – RE-PLAN – RESTORE. Let us start to consciously and joyously co-create a planet in which people CARE and PROTECT its land and waters for the COMMON GOOD. What is an ‘ER Unit’? An ‘ER Unit’ is a group of adults and children, that can be formed anywhere and at any time. Rather than feeling powerless and hopeless, people CAN get together in ‘ER Units’ and DO projects that ENHANCE their standard of living and simultaneously help RESTORE the areas where they live. It is recommended to involve the children, but not as child labour. Rather, to teach children sustainable principles of living, to cultivate in their young hearts and minds a sense of responsibility for the Earth, and to foment an altruistic sense of cooperation with others for the common good. It is also important to create a sense of fun and joy of communal work for the benefit of all. Please read our ‘ER Units’ Brochure. Feel FREE to Download , PRINT and DISTRIBUTE this brochure. What kind of projects can the ‘ER Units’ do? ER Units are about the community members getting involved in the management of the areas where they reside. Rather than leaving all decisions to local government officials, people are encouraged to take an active role in the management of their locality. In other words, it’s about people taking their lives and places of residence into their own hands. The most productive way is to create a NEW system of cooperation between the community members, as well as, between them and the local government. No longer is the local government allowed by the community to dictate and impose developments or projects without prior Consultation. This has been happening because communities have allowed it to happen. However, if communities kindly offer to also take responsibility for their neighborhood or village and its surrounding area, local governments are more likely to want to cooperate with the people. c) Provide technical assistance in some cases – such as in water quality monitoring and fisheries surveys. However, in order to avoid red tape and too much local government involvement, it is better to have the community act on its projects with or without the local government input, as much as possible. Community members will have to provide their time and work for FREE, and probably provide materials too. It is important to keep in mind that: whatever the ER Units do is for the BENEFIT OF ALL. So effectively, people are INVESTING in their future and their children’s. People are to participate in these ER Units because they WANT to ENHANCE their living conditions, because they want to REPAIR and HONOUR the Earth and waters in the areas they live in. By doing so, people effectively honour themselves. Working together gives people a sense of ownership and empowerment, and the rewards are many. ER Projects depend on the ecological and social issues in each locality. Therefore, the ER projects can only be set by the Community members, and could be done according to the level of urgency in solving serious problems. On saying this, the ER Units can embark in short, middle and/or longer term projects to maintain the momentum, the interest and the cohesiveness of the Unit. Reviewing local council development plans and sharing the information with the community. To do this you can ask university students or local NGOs for assistance. Organizing Community Meetings to discuss problematic issues or developments that affect the community. Requesting Community participation in local government decisions. To do this you can ask university students or local NGOs for assistance. Requesting funds to purchase materials (or plants) for projects from local government or international Aid agencies. To do this you can ask university students or local NGOs for assistance. Revegetation of riparian zones – to protect creek/river banks from erosion. Reforestation of areas damaged by clear cutting or mining. Reforestation for the Creation of ‘wildlife corridors’. Mangrove reforestation – in damaged coastal areas – to prevent sea intrusion and damage of productive areas by salinization. Cleaning canals – removing excess water weeds and rubbish. Clean Up Days – Garbage removal from: common areas, rivers, streams or beaches. Building storm-water runoff channels – to reduce flooding near houses or paddocks. Creation of Community Gardens – to grow food to be shared for all – in a neighborhood, a village or in suburban built-in areas. Creation of ‘Permaculture farms‘ (organic agricultural complex ecosystems) – to RESTORE the quality of the land and ENHANCE its productivity. Hence, to provide food for all – in common land. This scheme is particularly useful for Communities that have been relocated by the creation of Hydropower Dams or other government projects, and who been offered barren or poor quality land in compensation, such as in India, Laos and Cambodia. Monitoring water quality (i.e. taking water samples from bores, creeks or rivers and delivering these samples to the authorities for analysis). 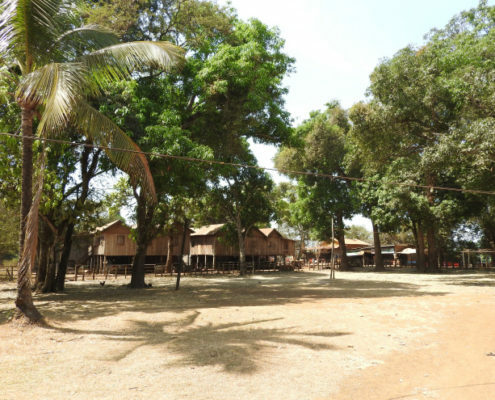 Building a Community Hall or School. People in each ER Unit could get together for a “Working Bee” – a working session, twice a month or as often as it’s suitable to the group. In a few months, people will be able to share meals from their Community Gardens or Permaculture farms. Permaculture is a combination of a self-maintaining, wholistic, long-term approach to sustainable organic food production (free of toxic chemicals), water storage, husbandry, aquaculture, forestry, ethical living, and more. It has general principles, but it must be designed and adapted to the local conditions, cultivating native species, etc. Hence, Permaculture farms require careful research and planning prior to starting them, and ‘team work’ to ensure a most productive long-lasting ecologically sound system. 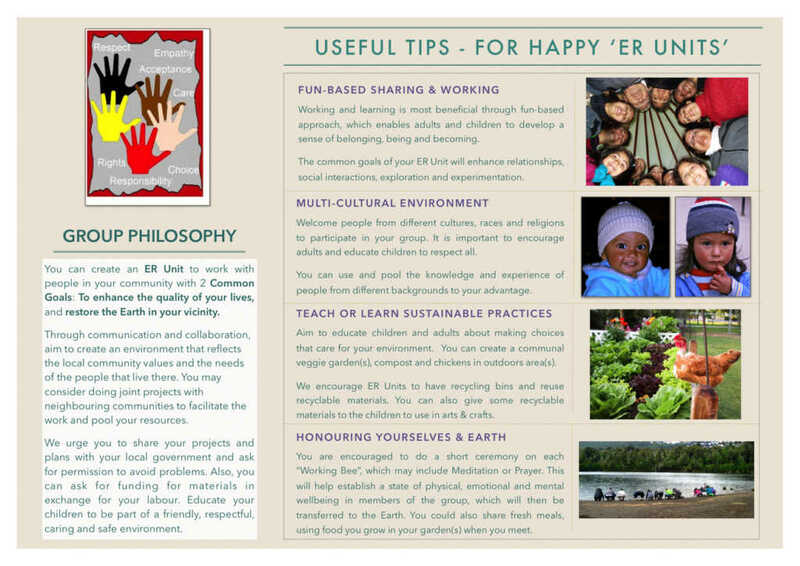 Contact the Permaculture Association – check their bulletin board. Send the smartest local youths to get a ‘Diploma in Permaculture‘ -to the nearest Permaculture Institute (in Australia, USA, Brazil, or others throughout the world). So these youth can come back to design the Permaculture Farm to suit the local conditions and teach others how to do it. Get people to come help you set it up through WWOOF (Willing Workers in Organics Farms). Create a mini-self-banking system for self-reliance. And, seek funding from local government, NGOs and International Aid Agencies. Below is also a link to a series of 40 videos by Bill Mollison the founder of Permaculture and by his main friend, in all sorts of subjects related to Permaculture, includes many amusing and fascinating stories. Only by working together can we maintain a better quality of life and a healthy planet. Edited 10 Feb 2016 – SIX villages will be drowned by the reservoir for the Lower Sesan 2 Dam, instead of FOUR as previously reported. 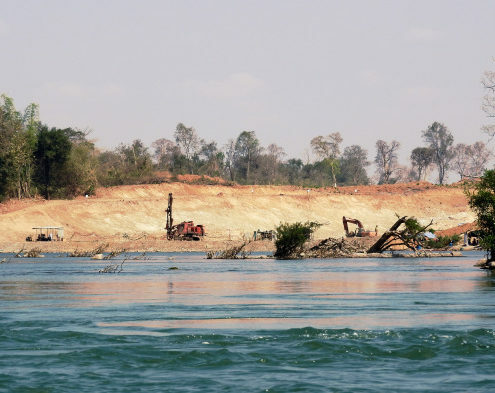 The controversial Lower Sesan 2 MEGA-Dam (LS2 Dam) is being built in the worst possible location: at the junction of two of the most important tributaries of the Lower Mekong River in northern Cambodia, i.e. the Sesan River & Srepok River. This dam has received strong opposition and criticism from scientists, fisheries experts, NGOs and Human Rights groups. 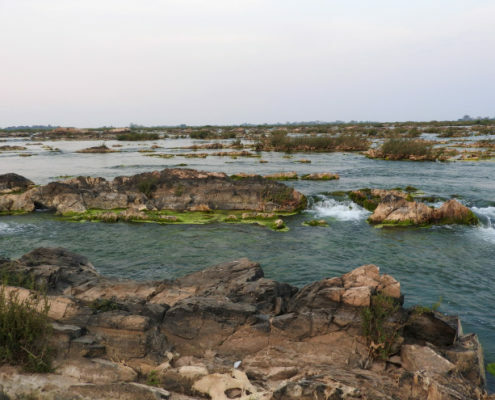 The LS2 dam will be located at a vital junction for the reproductive migration of dozens of Mekong River fish species. Hence, blocking this passage to two main rivers will alter significantly the reproduction of these species, biodiversity and fisheries of the area; and, will also have a major impact on the Mekong River itself as vital nutrient rich sediments are blocked by this massive dam. More importantly, thousands of families in SIX Villages in northern Cambodia will be displaced. A village located immediately downstream from the Lower Sesan 2 Dam has already been relocated. The remaining FIVE villages will be ‘drowned’ and the communities will be relocated to give way to the reservoir of the (LS2 Dam) in 2017. On the Sesan River: Srae Kor Mouy (1) & Srae Kor Pei (2). 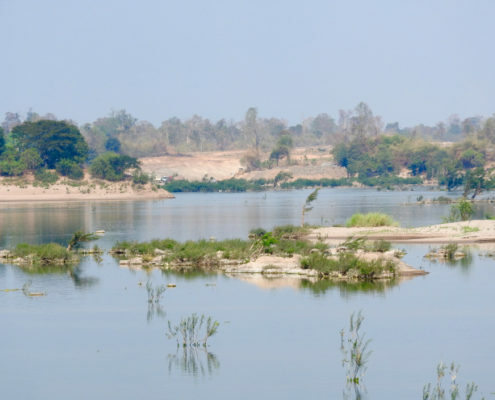 Over 500 families living in the Mekong towns of Srae Kor 1 & 2 -on the Sesan River, have strongly rejected this dam project from the time they were informed it would go ahead. During a Community Meeting held on the 3 February 2016, the Srae Kor Community asked the assistance of Scientists for the Mekong to publicise their case and their petition for fair Compensation for the loss of their homes, agricultural lands, harvests & livestock – as a result of their property being “drowned” by the reservoir for the Lower Sesan 2 Dam. 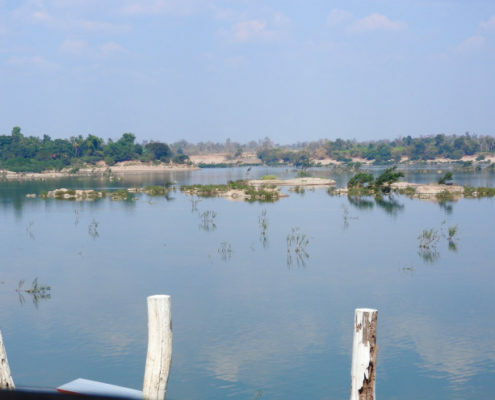 The community claims the Cambodian government advised them in late 2013 that the LS2 Dam would be built and they would have to evacuate the area. Construction started in 2014, despite the communities rejecting the project. The community says they sent signed petitions to all the Cambodian government authorities, the Developer and even to the National Assembly, rejecting the LS2 Dam project. They were told the government would solve the situation for them. But, nothing happened and construction went ahead. Cambodian government representatives returned to advise the communities they would be forcibly displaced as their houses, lands and property will be submerged by the reservoir. USD $6,000 + 5 hectares of land. The LS2 Dam is at present over 40% complete. The community was informed they will have to evacuate their homes & lands no later than October/ November 2017. The men in the villages are mostly fishermen. They claim all families have an average of 2-3 hectares of productive fertile land, which mostly the women use to cultivate their food. They say they also have well established fruit trees that complement their meagre diet of fish. “Fish populations have dropped so much, there’s very little fish available to us”. 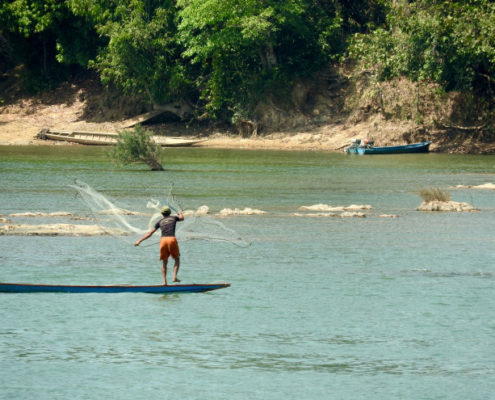 To this we replied, that in other dams in Laos and Vietnam, the fish populations in the reservoirs collapsed after about 2 years as fish could not migrate to reproduce. 246 families have chosen to leave the village and accepted the compensation offered. However, most families who had accepted the compensation returned to the village after they checked out the houses and the land offered by the government as compensation. The villagers are very dissatisfied with the compensation offered to them. They complained that the land offered is in a remote forest area, far away from the river they love and the source of their food and livelihood. They claim the size of the houses is too small and not as promised. 254 families refuse to leave... Of these, some say they may leave if offered fair compensation. Below are photos of the Relocation scheme for the villages of Sre Sronok & Krabei Chrun in the Srepok River, in northern Cambodia. This new resettlement area is located along the route to Ratanakiri province, around 50 Km from the LS2 dam. The remaining communities of Srae Kor Mouy, Srae Kor Pei & Kbal Romeas still need to be relocated. “The lots are not of the size promised, i.e. 100 m x 50 m.
Instead, the house lots are only 25 m x 50 m. And, the quality of the land is so poor we cannot grow any food on it. So how are we going to live – if we cannot fish and cannot grow our food? The government says they are helping us get a better life, but they are sending us into worse poverty. It can be clearly seen that the land surrounding the houses is too small and barren. This Compensation scheme in no way “improves the lives nor the standard of living of the displaced communities” as falsely advertised ! Locals demand the Cambodian Government and the Lower Sesan 2 Dam Developer compensate them fairly or else they refuse to leave. In their petition the Srae Kor Community stipulate clearly the compensation points sought. The Petition lists above were sent to the developer and authorities but the villagers have received no reply. These lists include compensation for: USD $30,000 per house, costs of different trees, etc. We stressed the importance for communities affected by the Hydropower Dams to hold both the Developer and the Government accountable. We advised the Community to seek legal aid via LICADHO – an NGO that will help them get free lawyers to represent them in court. We suggested the villagers ask their lawyers to seek an injunction against the Developer, if necessary to stop construction of the Dam until such a time as the Developer signs legal documents agreeing to fair compensation in consultation with the affected communities. We also suggested they seek assistance of ADHOC or EIR – NGOs that address the issues of Human Rights abuses, such as in this case. It is unacceptable to place thousands of families into further poverty without appropriate compensation. As it is, these people will be dispossessed and relocated, besides loosing their livelihoods and cultural sites. Therefore, the least companies that will be making millions of dollars at their cost and suffering can do is to pay them a fair compensation and ensure the people are not driven into deeper poverty. We offered to publicise their story in this website, through social media and through our future Submission to all Lower Mekong Countries regarding the Impacts of Hydropower Dams on the Lower Mekong River. P.S. 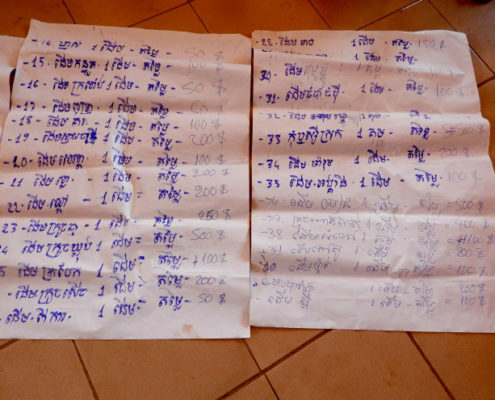 These notes were taken during our Mekong Reconnaissance Journey, assessing the impacts of Hydropower Dams on the Mekong River, its communities, fisheries, water quality and dolphins in February 2016. 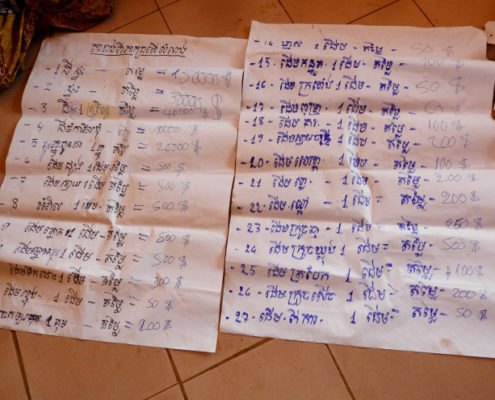 During a Community Meeting we conducted in the Cambodian township of Preah Rumkel, locals reported Fish Kills during the month of January (fish up to 30 Kg were found dead floating in the river). As well as, increasingly poor water quality. Locals stated that before the upstream dams were built they could safely drink the Mekong River water. However, since construction started on the Xayaburi Dam the water quality deteriorated significantly. They claim this is now even worse with the Don Sahong Dam being built less than 2 Km from this town. They reported a high incidence of coughing, vomiting and diarrhoea, both in adults and children in the past 2 years, which has forced them to boil the water before drinking it and even before cooking with it. We believe this is the result of upstream Hydropower Dams in Laos (Xayaburi & Don Sahong Dams) and probably upstream point sources of pollution, such as: mining, agro-chemicals runoff and sewage from Laos/Thailand/Myanmar. We can attest to the low water quality of the Mekong River at present. 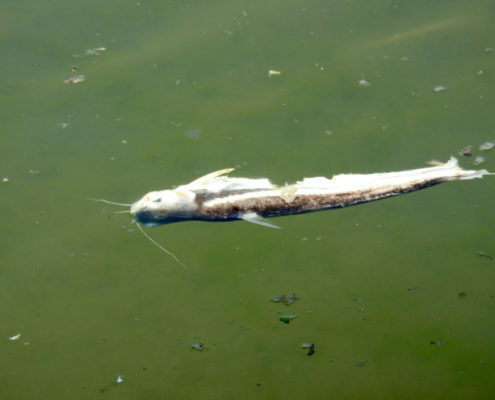 We found dead fish floating in polluted water in the area between the Don Sahong Dam & Preah Rumkel. 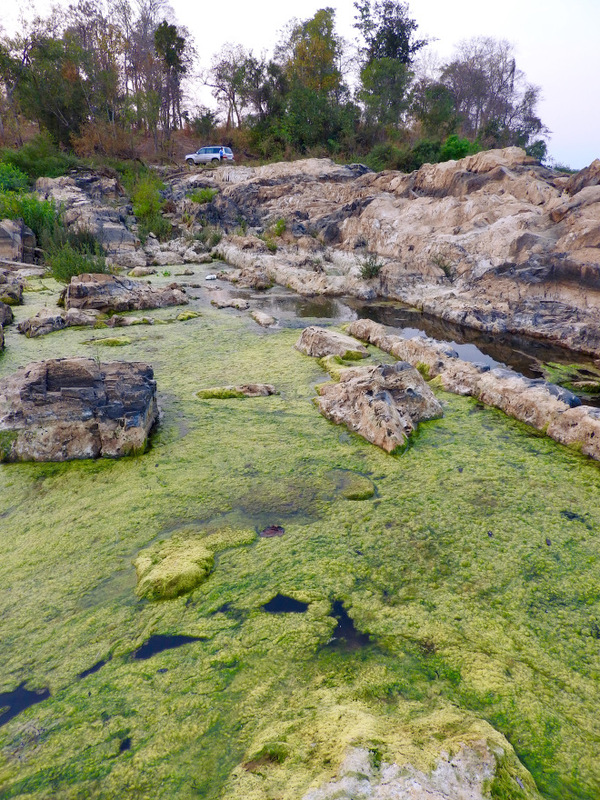 We also found putrid water at the nearby Preah NiMitt Falls – also called Sopheak Mitt Falls in Laos, located 8Km west of Preah Rumkel. 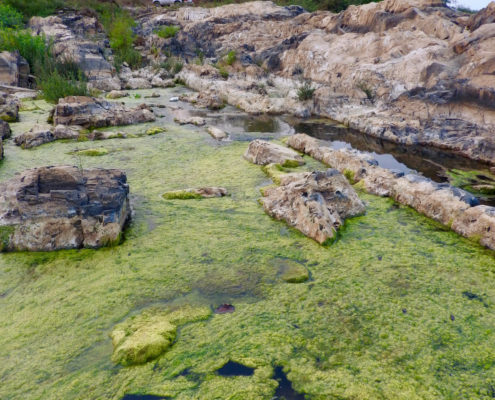 The water stinks so badly it left our clothes impregnated with a foetid smell, which did not come off after one washing, needing 2 washes to dispose of the stench… See green slime in photos below. Notice green slime covering putrid water. The stench was a shock to us. The present state of water pollution of the Mekong River on the border between Laos & Cambodia is a serious cause of concern. 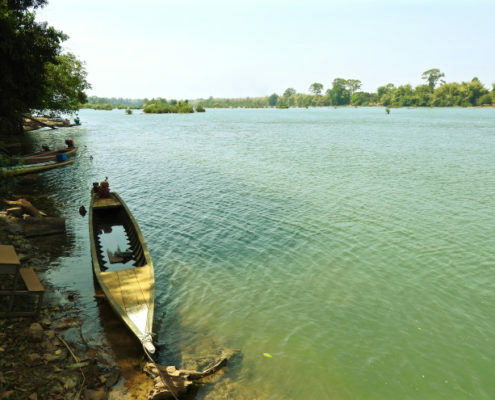 Thousands of poor people in the north Cambodian communities of Preah Rumkel, O’Svay, the Mekong islands and Ramsar Wetlands live and depend on the Mekong River as their only source of water for drinking, cooking, fishing and daily chores. On 2 Feb. 2016 we spoke to Mr. Kosal, representative of the NGO ‘WorldFish’ who was giving a workshop with local fishermen in the town of O’Svay. He revealed to us his concern regarding the Mekong’s low water quality and the impacts of Dams upstream on local poor populations in Cambodia and on fisheries. In O’Svay we were unable to swim in the Mekong River, because of similar foetid and slimy water to that seen in Preah NiMitt Falls. Hence, it is not surprising that fish kills are occurring. This situation is getting worse by the construction of the Don Sahong Dam across from Preah Rumkel and only a few kilometres to the west of the Ramsar township of O’Svay. Given that the Don Sahong Dam is being built on a Geological Fault Line – it is highly likely that this dam may eventually break in a major flood event coupled with a tremor. 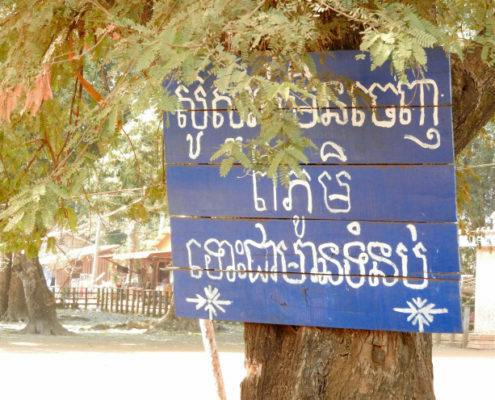 It is incomprehensible that the Laotian & Cambodian Governments have shown such disregard for the security of over 1,000 families living in Preah Rumkel, less than 2 Km. from the Don Sahong Dam site. If such a disaster occurs, it would be tantamount to eco-genocide! Moreover, thousands more people who live a few kilometres to the east of Preah Rumkel in the town of O’Svay will also be severely affected by a dam breakage. Yet neither the Laotian nor the Cambodian governments have taken into consideration the safety of such a large amount of people! 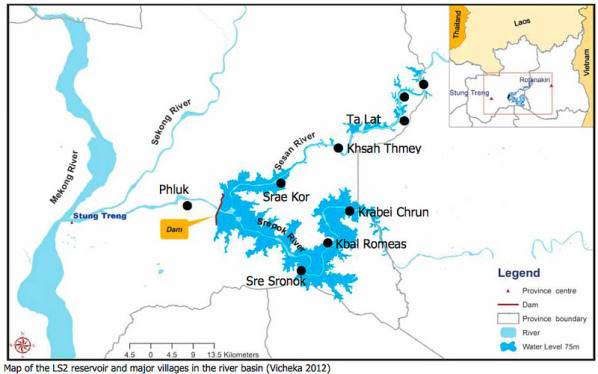 According to the Final Report of the Mekong Delta Study – Impact Assessment Report (MDS_IAR -see another of our blogs) released in January 2016, the breakage of the Sambor Dam would generate a tsunami-like flood-wave 8.5 meters high, which would impact on the town of Kratie located 35 km downstream. If the Don Sahong Dam breaks the tsunami-like flood-wave will be very high particularly as this event will most likely take place during a big flood. Such a flood-wave occurrence will certainly wipe out the town of Preah Rumkel and all its inhabitants – only 2Km downstream from the dam! That none of the governments concerned has bothered to take such an important issue into consideration is unbelievable. We informed the Preah Rumkel community of such a possible scenario so they can seek intervention by the Cambodian government. We concluded our Meeting with a Blessing Ceremony and Meditation by the local Buddhist Monks. Buddhist Ceremony Preparation at Preah Rumkel, Cambodia – Asking for protection for: the people, the Mekong River, the Fisheries & Dolphins. 2) The low water quality in the Mekong River – Urgent Toxicology tests are highly recommended.